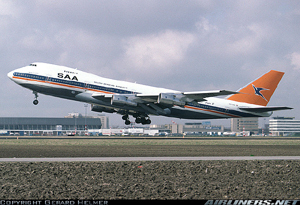 On November 28, 1987, South African Airways Flight 295 crashed into the Indian Ocean en route from Taipai's Chiang Kai Shek Airport to Mauritius's Plaisance Airport as the result of an uncontrolled fire in the airplane's main deck cargo compartment. All 159 people on board were lost. The crash occurred about ten hours into the flight, less than twenty minutes after the flight crew reported smoke to air traffic control in Mauritius. The airplane, a 747-200, was configured as a "combi," on which the main deck of the airplane is divided into two large sections, a passenger compartment and a cargo compartment. The method for controlling fires in main deck cargo compartments on combi airplanes relies heavily on manual firefighting using hand held fire extinguishers. Whether or not manual firefighting was attempted on Flight 295 is unclear, but considering the size of the 747's main deck cargo compartment and the apparent rapid growth of the fire that occurred, the chance that such an attempt would have been successful is questionable. After the accident, the FAA and other airworthiness authorities concluded that reliance on manual firefighting as the primary means to control fires in large Class B cargo compartments was inadequate, and regulatory action was taken to require design and operational changes.